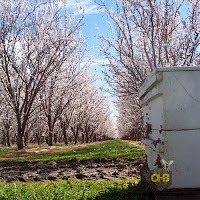 The Almond bloom in California a requires about 1 million colonies of bees. 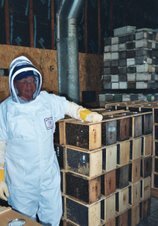 Beekeepers from around the country converge here in February. Almond trees are a unique tree. They bloom in February and California is about the only place in the world that provides the proper growing temperatures. Hive pollination fees range from $100 - $150 dollars per colony. Normally the early trees bloom around Feb 8. Later variety's bloom a couple weeks later then, the late bloomers come in a couple weeks after that. By mid to late March it is usually over. This year the bloom hasn't started yet. It looks like it will begin within the next few days. My source for this report claims that this is the latest bloom in memory. Being that there is no bloom happening, there is no pollen coming in. Queens can't be raised until fresh pollen is available. The drone population is lower without pollen coming in. Proper mating depends on large drone population and warm weather. Package bees can't be shaken until the bloom ends and pollination contracts are finished. My supplier of package bees does get permission from his almond grower to shake bees in the late stages of the bloom. Most almond growers don't allow this to happen until the last blossom falls off the trees. Normally grafting of queens will start a week after the bloom starts. This year grafting will start three days after the bloom starts. The bloom will be intense with many trees bursting open at once. Pollen will be coming in large quantities. All the California queen producers are all waiting for this to happen. This late grafting start may affect package bee delivery and early queen availability. Any delay should not be more than one week but it is to early to make any guess. I am concerned for my colonies. This cold has hung on a bit and is coming at a bad time. I know there is brood in the hive this time of year. This cold weather forces the bees to eat more food to keep the brood warm. The food will deplete around the brood. If the cold stays long or the bees are on a frame with not much food, there is a possibility for starvation. Even if there is frames of honey in the hive, the bees will not leave the brood. With the cold the bees will stay in a tight cluster unable to move to new stores of food. So it will be necessary to check the hives again to see if they survived this cold snap. A colony that was alive a week ago could be dead by the time the cold passes. This weekend it is going to get cold. I am looking forward to next week. It should be warm enough for a quick peek. Looking at my hives this time of year I never know what to expect. Dead bees in front of the hive spread around in the snow, that's normal. All the covers still on, that's good. A quick look at the upper entrance may have live bees crowded at the entrance, some maybe taking cleansing flights. My bee suit is on the smoker is lit. Taking the cover off, flaps go up on the winter cover, a couple puffs of smoke under the moisture board and the entrance holes. Lifting off the moisture board a quick gaze at the inner cover hole. Alive or dead? A little smoke, the inner cover comes up. Time for the quick peek. If dead, I look for a cluster of bees and try to determine the cause. If I see the bees with their heads stuck in the cells of a empty frame with their butts looking at me it is a sign of starvation. I clean up all the loose dead bees, close off all the openings and order replacements. If alive, how strong are they, 4 frames of adhering bees is a good number. Less than this they may be to weak and I may consider replacements. Is there food? It would be nice to have at least 3 frames of capped honey near the cluster of bees. If there is no capped honey near the cluster and I have some in the top box. I might quickly move a frame next to the cluster. No honey, I brought with me a roll of wax paper, a wood sugar shim, and a 10 lb bag of sugar. Smoking the bees down a bit, the 1-1/2" wood shim goes on, a sheet of wax paper not covering the bees if possible and not covering all the frames. I pour the bag of sugar on the waxed paper. The bees will eat the sugar for food, hopefully making it until March when I can feed syrup. Not much left to do. I close up the hives. Next inspection in March when I will feed syrup and pollen patties.